The apocalypse is here and life as you've known it has given way to a bloody chaotic fight for survival. 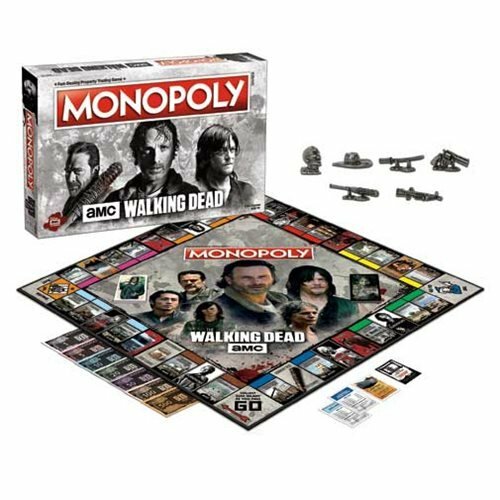 Live to see another day in The Walking Dead TV Show Monopoly Game as you acquire and defend safeguard locations featured throughout the hit AMC The Walking Dead television series. The 6 player tokens resemble Michonne's Katana, Rick's Revolver, Carl's Hat, Daryl's Crossbow, Negan's Lucille, and a Walker Head. This monopoly is a must have for fans of The Walking Dead TV show. For 2-6 players. Ages 18 and up.